Blood Orange Ricotta Cheesecake - Recipe! - Live. Love. Laugh. Food. Blood Orange Ricotta Cheesecake – Recipe! 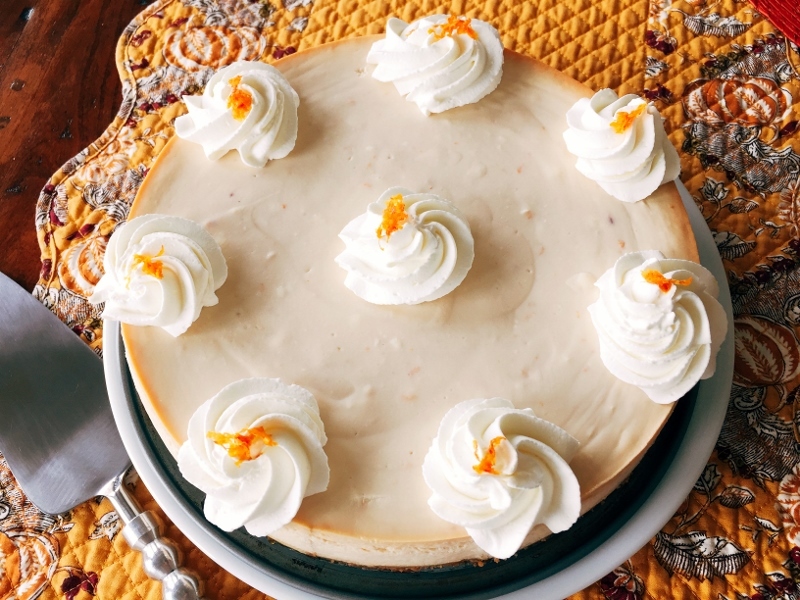 Cheesecakes are usually made with cream cheese however, Italians originally made them with ricotta cheese, which gives them a slightly different texture. I love the idea of using both cheeses to create a uniquely creamy consistency and delightful taste. Blood Oranges are super ruby in color and have a nice sweet citrus flavor during their prime season. When adding them to any dessert, the pigment changes slightly for a fun presentation. 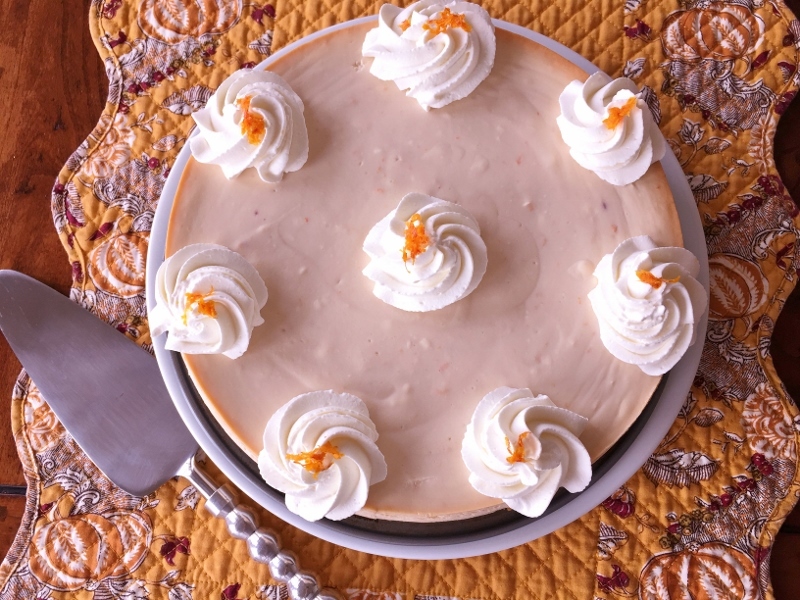 In this recipe for Blood Orange Ricotta Cheesecake, it turns a light peachy color because of the blood orange juice and zest – festive for the holidays. To finish the cheesecake, I piped a little whipped cream in rosettes on the top for a show stopping look. This Blood Orange Ricotta Cheesecake is great for Christmas or New Year’s Eve because you can prepare it a few days ahead and store it in the refrigerator until your guests arrive. Make Ahead Desserts are not a bad idea this time of year. 1. Preheat the oven to 325 degrees. In a food processor pulse together graham cracker crumbs, melted butter and sugar, until combined. Press crumbs into the bottom of a 9-inch springform pan. Bake in the oven for 10 minutes, remove and cool. Wrap the bottom of pan with foil. 2. In the same food processor, add all the filling ingredients, except the whipped cream. Blend until smooth, about 1 1/2 minutes. Pour on top of cooled crust and place a in roasting pan. 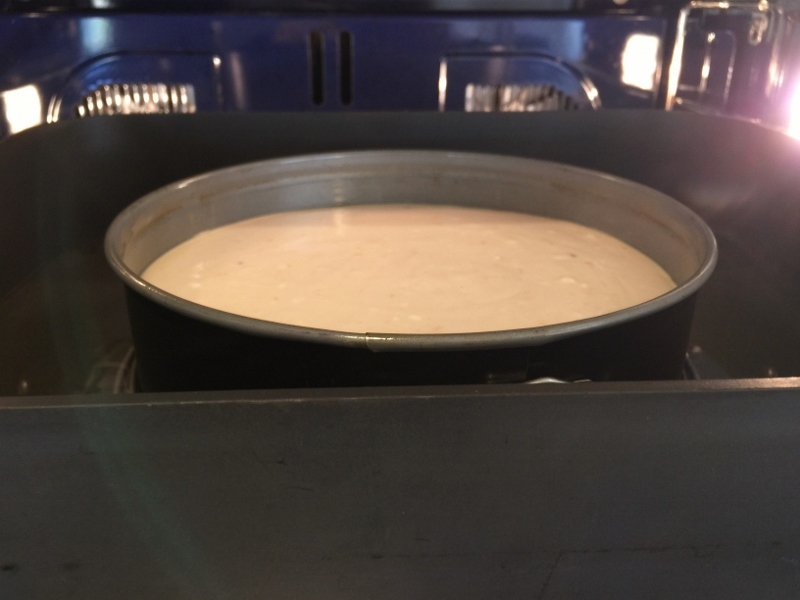 Fill the perimeter of roasting pan with hot water halfway up the sides of cheesecake. Bake in the oven for 50 minutes. Remove from oven and lift cheesecake out of water. 3. Cool cheesecake until room temperature, about 2 hours. Let chill in the refrigerator for at least 3 hours before serving. 4. Whip cream until soft peaks and pipe onto cheesecake or serve alongside. Enjoy! 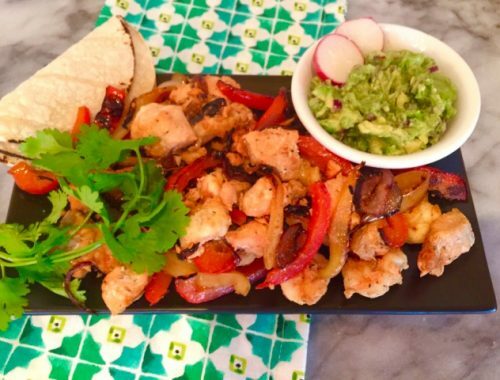 Salmon & Shrimp Fajitas – Recipe! 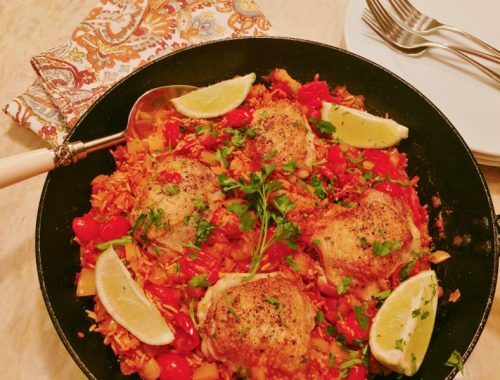 Skillet Arroz Con Pollo – Recipe! 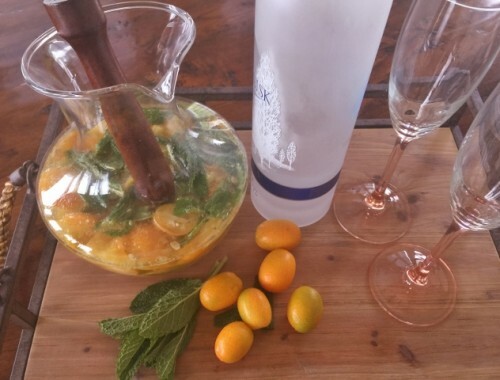 Kumquat Vodka Mojitos – Recipe!